Baby turkey (poult) hatched in the incubator! Now what…….? Are you ready for turkey parenthood? Watch or purchase the endearing documentary "My life as a turkey" about a gentlemen raising Florida wild Osceola turkeys and you might decide the following aggravations are worth the challenge! If we have a turkey hen with young birds available, that is birds of the approximate same age, (ideally not over a week in difference) we will remove the poult from the incubator and slip the baby bird under the hen. When done at night, the process is simple and quick and very unobtrusive to the hen. Still I cup my hand protectively around the little turkey during the exchange because sometime the mother hen will strike out with her beak. –I will take the hit. The placement can be done in daylight; however it has to be at time when the hen is sitting and not walking about. This is critical in the cool spring season; the hen has to provide warmth to the little one. In the hotter months, the new baby can be placed nearby and the hen -most of the time will settle down on the squeaky baby. If however the hen walks about upset at the presence of a human too close to her babes, simply leave and check every 5-10 minutes. Each hen will react differently. However keep an eye on the babe and return the poult to the incubator or brood box if you suspect the baby is getting cold. Speaking of “How hens will react” –some hens will perceive the very act of “placing” the poult near her as a threat towards her other babies. The resulting calamity could be a scenario where the mother hen stomps on the new baby in a panicked effort to defend it. When possible you want to comprehend the hens’ disposition (is she mellow or always in a defensive-attack mode) if the mother hen is too high strung, perhaps it is better to wait until dark to slip a new baby under her. My favorite picture out of thousands of turkey pictures. So forgive me that I used it three times. No hen available? Then you will need a brooder or rather a “Brooder box” Hatched poults will be removed from incubator and placed in a brooder. If no hen is available, we normally remove the poult from the incubator as soon as the feathers dry and usually only about an hour. 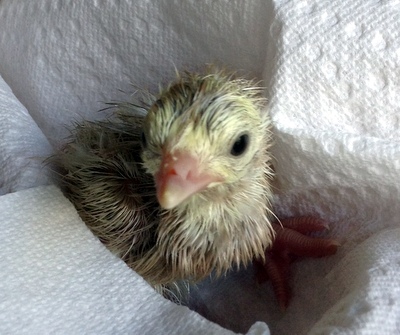 However...Sometimes birds are kept in the incubator longer. Each poult has a different amount of struggle to get free of the egg and recovery varies. Birds that hatched prematurely from the egg being crushed or damaged may have to stay in the incubator up to 48 hours. Also birds that have s herniated umbilical are kept for longer periods in the incubator. We have had surprisingly good survival rates and in most situations both premature and herniated birds survive and are placed to a hen or in our brooder. This is "Honeybird" and her brother "T-Rex", who imprinted on us as their parent. Guess I'm going to have write something about "imprinting"
Security: from external threats like your cat & also to keep the birds contained. Depending on your brooder set up, you may require a screen cover. I trimmed a section of chicken wire just for this purpose. Temperature should be around 98-102 degrees with enough space for turkey poult to find the sweet spot of not too cold and not too hot. There should also be some method to reduce or control cold drafts. If the baby turkey is cold (for example the heat lamp is too high) the poult will emit a plaintive cry (chirp) much as a human baby would when uncomfortable. A sheet of aluminum foil can be placed over the brooder to hold in heat. Shallow food and water dish. We use a heavy glass ashtray for both and place a shiny dime in the water container (turkeys and people love bling) If you cannot find a shallow water dish, gravel can be placed in the container ensuring the baby turkey cannot get in drown. As the birds grow, you can adjust the size of water and food containers. Note: the very combination of the word “shallow” and “baby turkey” equals a mess. Water bowls contaminated by defecation and baby food scratched out. Like the incubator, a clean brooder is a healthy brooder. And as always, wash your hands after touching the food and water containers or cleaning waste. Note on "brooder box" we personally avoid cardboard boxes for this purpose. For one, there is a heat source associated with this task and second, water will be spilled. I worry both about a fire and about a soggy mess. Also, --our very first turkeys we used a kiddie swimming pool. Perfect! (or so we thought) until at only 6 days old the turkeys could jump out of the pool and we were backtracking. 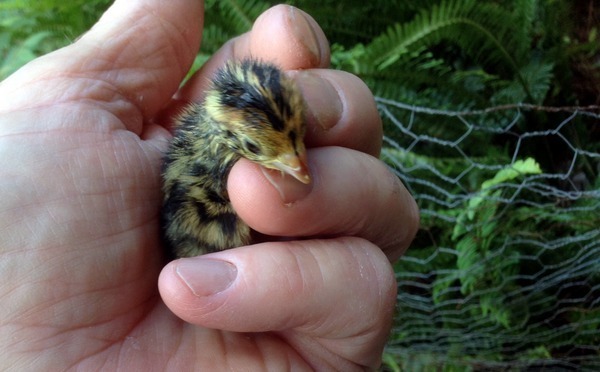 This little quail was added to the brooder. So cute and friendly! Food: The baby turkeys will require a finely ground high protein food from a feed store. Normally the food will be termed something like “Game bird starter” You may have to make a special request for the store to sell you a small (1-5 pound bag) of starter, as they normally come in 50 pound bags. The big box stores normally sell a five pound bag of “Chick starter” for baby chickens. This will be fine for a few weeks. But eventually a healthy turkey poult will require high protein food. As a treat, the poults will love if you can drop some freshly picked grass clippings cut to their size. You will hear their happy chirp as they gobble down the grass. Note: You will often see a mother turkey clip grass and feed the leaves to her babies. Because we have a soft heart, we place a mirror at ground level. Have I mentioned turkeys are social animals? 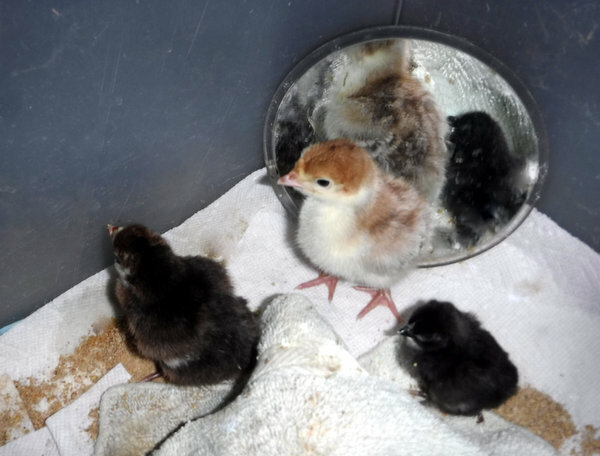 The mirror is most important when your only have one bird in the brooder. Our other soft spot is we place a small stuffed animal in the brooder and lay a small cloth over the animal to simulate a mothers’ wings. The turkey poults readily scoot under the ‘wings’ and nuzzle. Once again, the happy chirp sound and a baby fast asleep. The turkey alarm call is a sharp “Brrrtt”. It is pronounced as “Ber-rit” only said fast, rolling the ‘R’s. The mother usually does two: “Brrrtt, Brrrtt” chirps when spying a raptor. I hope this experiment wasn’t too mean. But I once sounded the turkey warning alarm to day old turkey poults in the brooder (who had never seen an adult turkey) and the babies scattered and flattened as they do when a real turkey gives the alarm. “Wow” was my response with some guilt. That is some heavy duty survival programing. I would say at 3-4 weeks old (and it is not so cold at night) you can move the poults to an outside dry pen/coop. However if needed, move the heat lamp with them! The back story to the above picture is that a bobcat killed the hen on the nest but did not hurt the eggs. We had to incubate and raise these until another hen had poults & we could foster them. The white birds are "Royal Palm turkeys" that start off yellow in color.